The 2015 Kicking World All-America Team is comprised of the best HS & Collegiate kickers & punters from across the country. On Tuesday night, January 5, 2016, Coach Brent Grablachoff released the 2015 Kicking World All-America Team, comprised of the best kickers & punters in the nation for the 2015 football season. This year we are pleased to announce two different 2x recipients. Andrew Hicks (Class of 2016, Mill Valley HS, KS) and Evan Lewis (Class of 2016, Agoura HS, CA) were All-American kickers in 2014, and now earned 2015 Kicker and Punter All-American honors. View the complete 2015 Kicking World All-America Team. 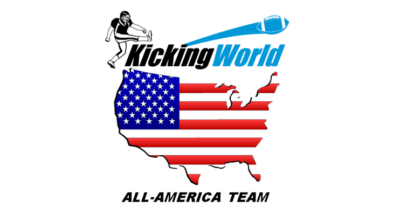 The 2015 Kicking World All-America Team is comprised of outstanding prep kickers & punters from junior and senior classes from Texas, Kansas, Virginia, Kentucky, Georgia & Nevada. The 2015 Honorable Mention recipients consist of kickers & punters from Florida, California, Tennessee, Oregon, New Jersey & Indiana. Coincidentally the entire list (including Honorable Mention recipients) except two honorable mentions (Milazzo & Torres), are on the Kicking World Hot Prospect List. Nine of the Fourteen students on this year’s All-America Team participated in the 2015 Kicking World Invite-Only Showcase Event. While we have camps in 22+ different states, this year 2 states claimed the most recipients (California & Virginia). Congratulations to our 2015 Kicking World HS All-American Team! In addition to our HS All-Americans, we would like to announce our 2015 Kicking World College All-America Team. Congratulations to standout kickers Daniel Sobolewski (Albright) & Peter Yoder (Richmond) on outstanding 2015 college football seasons. These young men put several points on the board and proved their consistency over the long collegiate football season. Daniel Sobolewski has now earned his 3rd consecutive Kicking World College All-American honor and Peter Yoder is now a 2x Kicking World All-American! Daniel Sobolewski (Albright) has kicked a 75 yard field goal in practice and has put together a very consistent college kicking career. He has been actively scouted by the Philadelphia Eagles & New York Giants. He has a legitimate chance of taking it to the next level. Peter had a standout 2014 season at Richmond and followed it up with a very consistent 2015 season. As always, the Kicking World All-America Team consists of standout kickers & punters whom we personally coached at private lessons and/or camps. Students are nominated by the Kicking World staff, high school coaches, and students & parents can submit their stats & video at the end of the season for consideration. Coach Brent makes a final decision based on various metrics. We wish the 2015 Class of Kicking World All-Americans much continued success in their kicking & punting endeavors!